The Rock Poster Society (TRPS) is pleased to announce the rock poster art event of the summer. 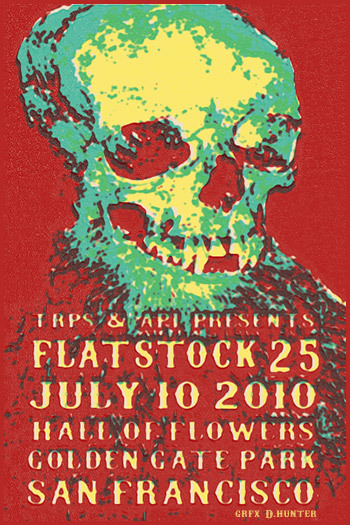 TRPS is teaming up with the American Poster Institute to present Flatstock 25 – By the Bay on Saturday July 10, 2010 at the Hall of Flowers in San Francisco’s beautiful Golden Gate Park. The show will run from 10:00 a.m. to 6:00 p.m. The FLATSTOCK poster show series is presented by the American Poster Institute (API). It is an ongoing series of exhibitions featuring the work of many of the most popular concert poster artists working today. The Flatstock shows in Austin, Seattle, Chicago, and Hamburg are known worldwide as premier events in the poster world. The very first Flatstock was held in San Francisco back in the nineties, and they’ve long wanted to come back out here for their landmark 25th show. TRPS’ Rock Art By the Bay artists show has been a regular happening every summer for some years now. Melded with the Flatstock event, this will be a very special show. TRPS is thrilled to be working with API to bring this landmark event to San Francisco. In keeping with Flatstock and Rock Art By the Bay tradition, this show will be artists-only, and admission is FREE to the public. We’re expecting an outstanding lineup of artists for this one, and this is a great opportunity for us to introduce a lot of new faces to the Bay Area poster community. Mark down the date Saturday July 10, 2010 on your calendars. You won’t want to miss this one! I hope to see you there! 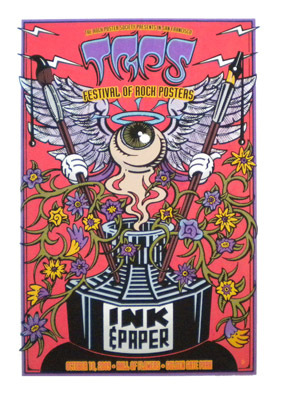 TRPS is hosting Festival of Rock Posters, this Saturday, October 10, 2009 at the Hall of Flowers in Golden Gate Park (near Ninth and Lincoln). Admission is $10.00 – $5.00 for TRPS members with card. This years Artist Relief Trust benefit poster is donated by artist Gary Houston, (shown above) This official show poster will be a limited edition, signed and numbered, hand-pulled silkscreen print, only available at the show. All proceeds from the sale of this poster will go straight into the TRPS Artist Relief Trust, to provide help to poster artists in time of need. Confirmed artists and dealers include: PNE (Post New Explosionism: Emek, Justin Hampton, Jermaine Rogers), Malleus (from Italy), Drowning Creek Studios (Jeff Wood with Johnny Thief),Burlesque of North America, The Firehouse (Chuck Sperry and Ron Donovan), Wes Wilson, David Byrd (of Fillmore East fame), Stanley Mouse, Victor Moscoso, Dave Hunter, Gary Houston, Lee Conklin, S.F. Rockposters, David Singer, Randy Tuten, Alan Forbes, Justin McNeal, Marq Spusta, John Mavroudis, Paul Imagine, David D’Andrea, Bob Cohen (Avalon co-founder), Chris Shaw, Alex Fischer, Eric King, Carolyn Ferris, Tea Lautrec Litho, John Seabury, Gregg Gordon, John Howard,Cahoots Graphics (Dennis Loren), Ryan Kerrigan, fillmoreposters.com, Jim Pierce, Pat Ryan, Perry Pfeffer, Dano Kuhlken (DKNG Studios), Connected Music, Larry Freeman, Cliff Yamasaki, Vince Dugar, Political Gridlock, Sherwood Donahue, Helie Robertson, Tom Hill, Kris Mikkelson and Ron Schaeffer. Creativity, love and respect for all things. Freedom for an individual to make a choice – sexually, spiritually and socially. The right to be different and still belong. Honor in refusing to fight without judging those who did. Our right to make a difference. Our right to think independently. Our willingness to share with others.